We’ve got just the thing (or two, or three) to jump start your Spring/Summer collection for your business. You may not think it, but spring/summer is the easiest time for add-ons to boost your UPT in sales because there are so many opportunities to up-sell. Therefore, jewelry and accessories will be your best friend, apart from the main pieces of the collection. Here, we have created a compilation of our favorite pieces from our SS 2019 collection. We have also added some cute add-ons that would go perfectly together with these items. Style DD2819 This Gauze Cover Up With Front Adjustable Tie is an add-on of it’s own. Yup, you heard it here first, this layering piece is the perfect cover-up for all spring/summer outfits. This light-weight outer screams festival season without a doubt. The simplicity of this piece will make it an easy add-on to any look no matter how loud the print may be. Nobody will be able to say “no” to this item when suggested! 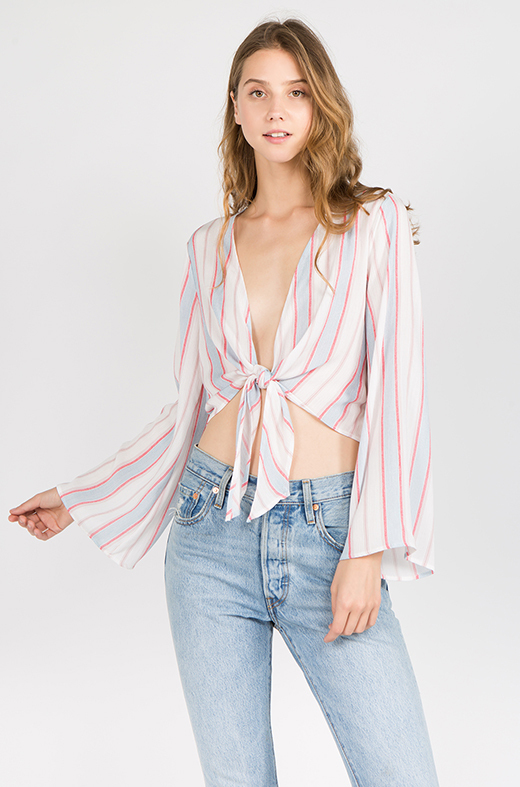 Style TD1346 This Gauze Stripe Tie Crop Top features a beautiful bell-sleeve and deep-v neckline. These attribute for the perfect piece to layer jewelry. These tops are perfect when styled with longer and shorter necklace pieces layered to perfection. This is the perfect opportunity to up-sell jewelry at your countertops and check-out stations. Style SD3094 This Ditsy Floral Wrap Skirt has so many opportunities that we don’t know where to start. Let’s start here: these skirts look amazing when styled with a bodysuit or bra-top. This makes it an easy piece to suggest all different type of add-ons. These skirts also give off a totally different vibe depending on what shoes you pair with it: whether it be a casual look with sneakers or a dressy vibe with heels. Here are some bodysuit suggestions from our collection to go with this skirt: Style PD4059: Jersey Strapless Bodysuit With Adjustable Front Bow Style PD4028F: Jersey Bodysuit, TD1116: Jersey T-Shirt Bodysuit. Visit Us & View Our Newest Collection! These pieces, as well as our newest collection, will all be available for view at MAGIC on February 5-7, 2019 at Booth 71512. We hope to see you all there!